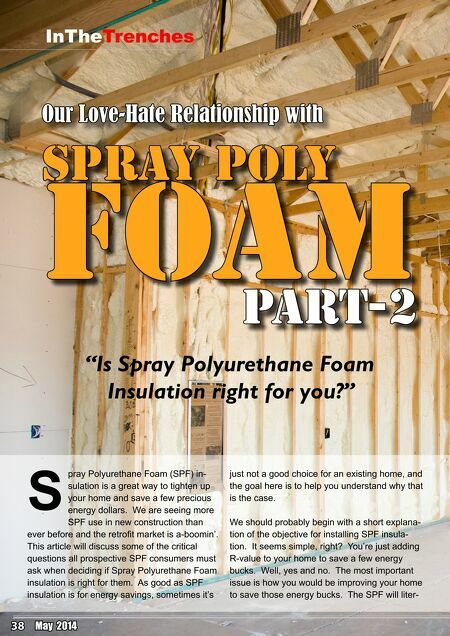 38 May 2014 InTheTrenches Spray Poly Foam Part-2 Our Love-Hate Relationship with pray Polyurethane Foam (SPF) in- sulation is a great way to tighten up your home and save a few precious energy dollars. We are seeing more SPF use in new construction than ever before and the retroﬁt market is a-boomin'. This article will discuss some of the critical questions all prospective SPF consumers must ask when deciding if Spray Polyurethane Foam insulation is right for them. As good as SPF insulation is for energy savings, sometimes it's just not a good choice for an existing home, and the goal here is to help you understand why that is the case. We should probably begin with a short explana- tion of the objective for installing SPF insula- tion. It seems simple, right? You're just adding R-value to your home to save a few energy bucks. Well, yes and no. The most important issue is how you would be improving your home to save those energy bucks. 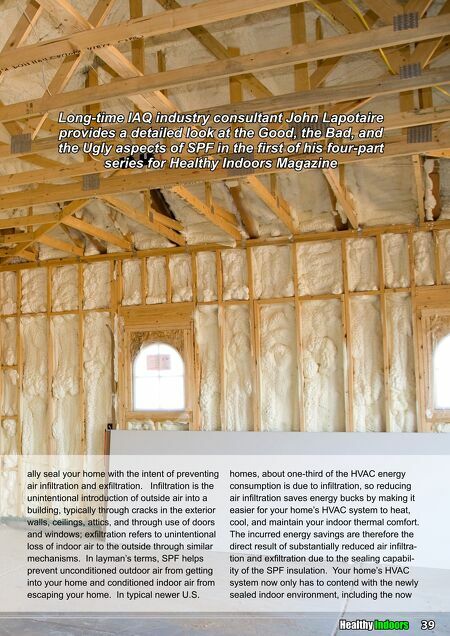 The SPF will liter- S "Is Spray Polyurethane Foam Insulation right for you?"